Now that I’ve had a chance to catch a little shut-eye after a restless late night flight from the San Francisco Airport to Baltimore Friday night, I’ve been able to sort through the pictures I took on the trip. I bought a new camera the day I began my journey, and I’m still getting used to it, so sadly many of my pictures were a litle too blurry to share. But some of them turned out ok, and a sampling of those appear below. 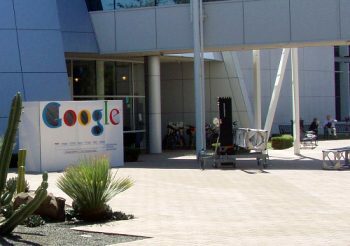 Before traveling to the Search Engine Strategies Conference, I had the chance to spend a few days touring around San Francisco, including a trip to some wineries in Sonoma Valley. 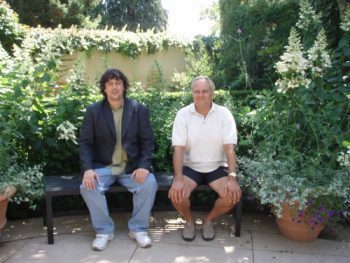 Here’s a picture of me and one of my hosts, Barry Swain, relaxing in front of a wine tasting room. 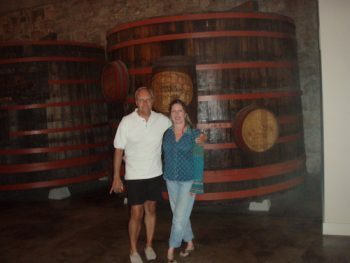 Donna and Barry Swain, who gave me a great tour of Sonoma Valley and part of Marin County. Donna volunteers with me as one of the moderators at Cre8asite Forums. 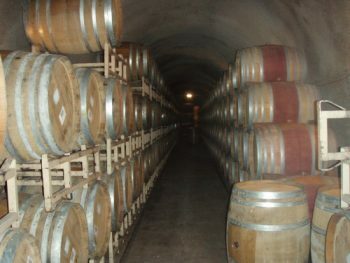 One of the wineries we visited had over half a mile of underground caves which they used to store their wine. The drill used to make the cave was of the same type used to drill the tunnel under the English Channel. 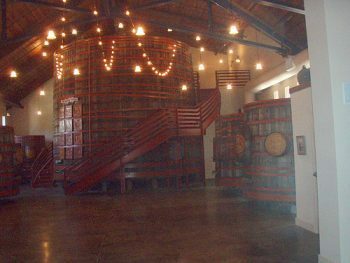 Another winery hosted the largest barrel of wine I’ve ever seen. 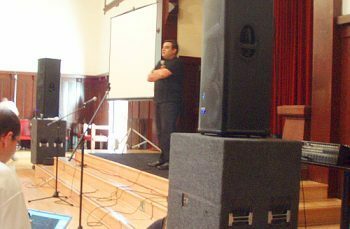 On the Saturday before the conference, I attended Wordcamp 2006. 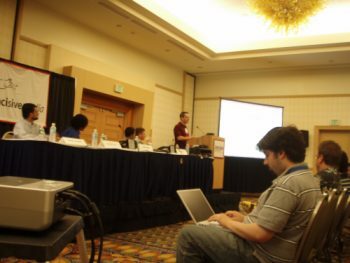 Om Malik gave one of the many excellent presentations at the conference, as did Neil Patel and Cameron Olthuis. 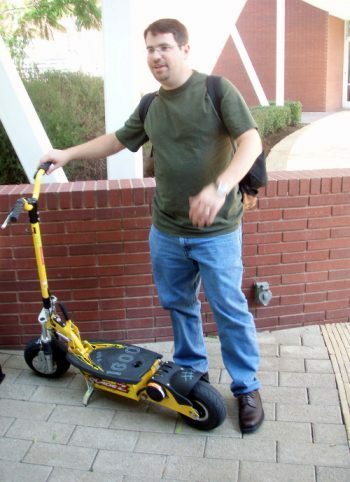 During the visit, Matt Cutts showed us how googlers sometimes traveled from one building to another. We weren’t allowed to take pictures once entering the buildings. 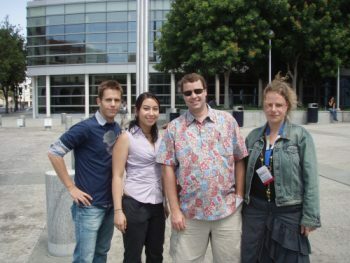 Some of the folks who joined me on the trip to the Googleplex Monday afternoon – Matt Inman and Rebecca Kelley of SEOMoz, David Zuls, and Susan Geraeds. 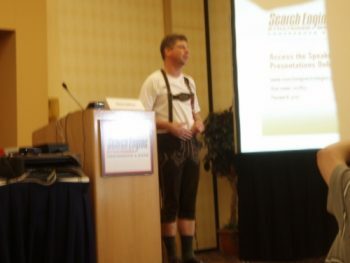 …Danny Sullivan, wearing a pair of lederhosen – as a result of a lost bet over the world cup. Great pictures Bill, so did the wine taste good? The wine was very good. I’m not a big wine drinker, but there’s something special about being on the same land that the grapes are grown upon, and blended, and fermented, that made them taste special. I have a much larger appreciation for wine and the people who grow it, now. I’d definitely recommend that people visit Sonoma or Napa valleys if they can. It was amazing seeing all of those grapes growing in the California sunshine. The conference was a lot of fun, and it was a pleasure to meet you there. Hopefully I’ll run into you again in San Jose next year. Looking at the pictures, may have to find my way to San Jose (sorry about the rhyming), let along London. It would be nice to meet you, Peter.